My shower installer drilled the hole too small for my existing older Delta monitor faucet. The plate I have will not fit flush to the wall. Is there a wall plate/escutcheon available that is flat that will align with the Monitor mounting screws positions? Thank you for your question. 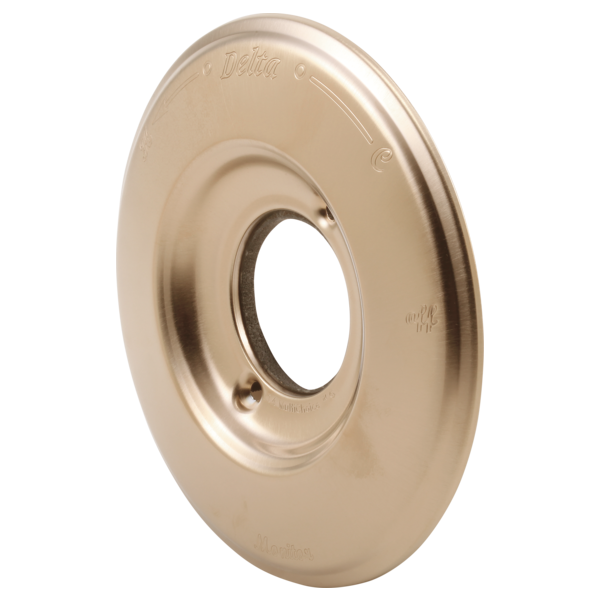 To properly seal your escutcheon plate onto the wall, you will need to screw it in the valve. We recommend contacting your showerin installer to fix the original problem so Delta Faucet model # RP34353 can be installed properly. Does this come with screws? If not, where do i find the number for the oil rubbed bronze screw number to order? Thank you for your question. Delta Faucet model # RP34353RB does not include the screws. The model for the screws is RP196RB, and can be purchased from your local retailer or wholesaler. Thank you for your question. Delta Faucet model # RP34353RB is manufactured of metal.